Abstract: For years, there has been a need for teaching students about business process integration. The use of ERP systems has been proposed as a mechanism to meet this need. Yet, in the midst of a recent economic crisis, it is difficult to find funding for the acquisition and implementation of an ERP system for teaching purpose. While it is recognized that the use of ERP systems might provide a variety of benefits in a business school curriculum, how could business schools overcome the limited resources in order to bring in and integrate ERP systems into their business core classes? 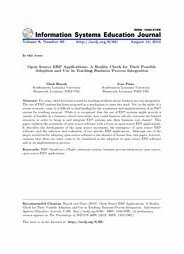 This paper explores the potentials of open source software with a focus on open source ERP applications. It describes the development of the open source movement, the emergence of open source ERP software, and the selection and evaluation of two specific ERP applications. Although one of the major incentives for adopting open source software is the absence of license fees, this paper, however, cautions that there are other costs to be considered in the adoption of open source ERP software and in its implementation process.